In replies to comments on my previous post I promised to tell this story. Disclaimer: it’s a cat story, and no perfumes were harmed involved. Last year we found ourselves in between couches: the old couch was re-homed while the new one was delayed. Even before that you couldn’t say we had an abundance of furniture or places to hide, especially in areas to which Rusty has access. So with the approaching 4th of July’s fireworks, which always terrify our cat, I felt a little guilty for disrupting Rusty’s environment. And to compensate that, I came up with the idea to make an artificial hiding spot for him. It goes like this: I would take a treat in my hand, say “Catch!”, and Rusty would start moving away while still looking at me (he reminds me a player in American football who “goes long” keeping an eye on a quarterback), then I would throw a treat, and Rusty, after “spinning” in place for a couple of milliseconds while his paws get traction with wooden floor, would sprint after the treat. It would be naïve to expect a cat to bring it back – hence “Catch.” Once he’s done eating, I call him back: “Come-come-come!” (in an unusual for me high-pitched tone) and when he comes, I give him the second treat. Unlike other tricks that I make him do for my or our guests’ amusement, this one is done to make him exercise a little for the first treat and to teach him to auto-respond to that unusual call – for those unpredictable cases when I might need to find him quickly or make him come to me. While Rusty is busy catching and eating the first treat, from time to time I would put the third one into his pet cave. The first couple of times I did it, he found them quickly. My vSO suggested that he either saw or heard me doing it. 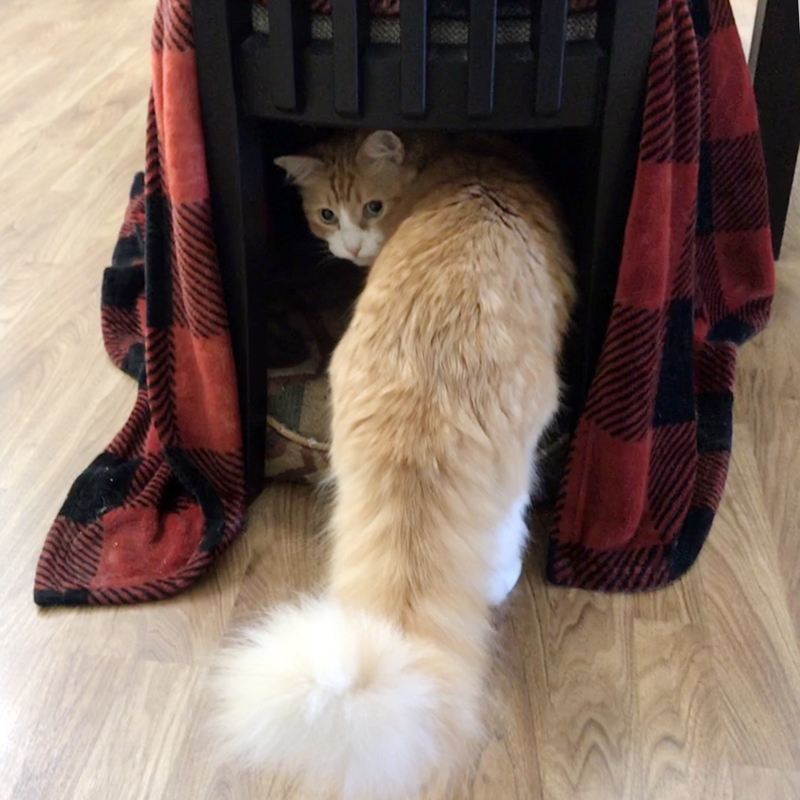 So the next time I made sure that I stood close to the pet cave – so that I could put a treat in without moving while being sure that Rusty wasn’t looking. As you can imagine, the result was the same. It’s great to see you, Jillie. Thank you, Brigitte. I will do more cat stories. Promise. That is for sure! He’s on a constant quest for more treats and food in general. Oh this was too good. What a clever cat Rusty is, despite thinking treats sprout like mushrooms :) Getting a cat to catch cannot be easy. That is one intelligent cat. Pavlov puss! And handsome with it. I love Rusty stories. He’s the bomb. I love my dog but wish I could have a cat (husband is allergic) because I am intrigued by their intelligence. Well… I love Rusty but he’s definitely not the most intelligent pet I’ve ever met (though he got much smarter over years). Now Rusty sounds like one of the ‘trainable’ ones. I guess he’s an only child? Lucky you got a cat that deigns to play the ‘let’s amuse the human’ game. I have four of these charming critters. Only Ophelia became trained. Similar to Rusty in disposition, I suspect. Eager to have you believe that she will do your bidding and execute all sorts of feats, some rather demeaning to her essential ‘cat-ness’, but, she will play along nevertheless. Be forewarned, Undina. This is just a ruse. While both Rusty and Ophelia seem to be ‘trained’ what they have done, quite obviously I should say, is they have cleverly succeeded in training their humans. To wit: to spend money and exert effort to buy said treats, to engage in activities quite un-human like, namely in constructing things such as ‘pet caves’. You would agree, I hope, that untrained humans are more likely to be found constructing human caves for their own benefit rather than that of an animal. And like others of his kind, Rusty has ensured that you are now trained as well, to stand in place, at a designated spot, in order to be unobserved when hiding his treats for his benefit. So both Rusty and Ophelia have succeeded in their mission. For the record, my other cats have no interest in training humans in the higher arts. They are satisfied with me having learnt only the simple tricks. Providing food and water in designated places, tending to their toilets, uttering affectionate sounds and rubbing their tummies. Unlike Both Rusty and Ophelia they hold no higher ambitions. Undina, get your hands on a book called Cat Flap by Alan S. Cowell. I’m sure you will enjoy it. It’s very clever. Oh, yes, certainly, we are well trained by our cats (and yes, you’re correct: Rusty is an only child :) ). And building pet caves isn’t the strangest activities we get involved into to accommodate our furry kids. I don’t think, though, that Rusty does any of those tricks for us: I think he considers them some strange rituals that bring those treats. His version of a rain dance. That sounds like a grand pet cave and it’s so great that Rusty is willing to do tricks in order to get a treat. He surely isn’t a super lazy kind of orange tabby. And I’m sure he’s gotten a serious bunch of treats due to all compliments he’s earning from us anytime you post a photo of your handsome sophisticat. I try to reward Rusty for his contribution to this blog (although made not quite voluntarily). But other than trying to escape my camera when I want to take a picture of him, he’s a great cat. “Being extremely food-motivated…” I have yet to meet a cat that isn’t :-D Agreed, some more than others. I started to see if I could teach Vega the trick of knowing where the treat is from under two different cups which are moved around. But I found it a little cruel, since she doesn’t seem to understand where the treat went, when it disappears under the cup. Asali, I would have said the same thing 20 years ago, but after coming to the U.S. I discovered that there are many cats who are not too interested in food: they can eat something from their bowl, leave it half-finished and go away. And out of all local cats I know, Rusty is the only one who loves human food and never leaves anything in his bowl. He got an extra treat in your name. Awww, great story! Love the pet cave. I have several for my rabbit, but now I’m stealing your idea to make a new one for him. I remember you doing the “jump, jump!” trick for a treat when I visited you. It surprised me that you could get a cat to jump straight up in the air like that. Your description of Rusty “going long” for a catch, though, is truly fantastic. Would love to see that. You’re a talented trainer, Undina! I’d love to see pictures of Boxer in his pet cave – old or new one. Ah Rusty! I am going to try the “go long, then come back” two-treat-trick with mine and see if they will adopt it. It sound both adorable and *useful*. These two both sit very nicely for treats, but we’ve not added to their repertoire. I think you are right in the idea that they associate the behaviour with generating treats… Atkins, at least, will sometimes pause in her ambitiously-early meowing for dinner by running to the kitchen to sit, and then return looking a little baffled that food did not magically appear. 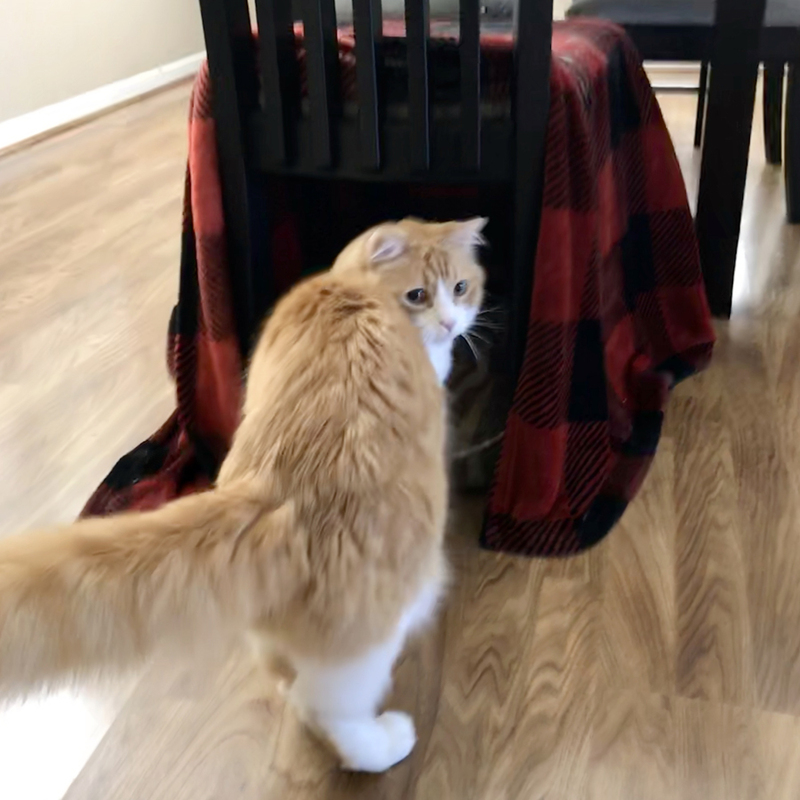 Rusty learned that “Catch” trick just several years ago, being a fully adult cat, so I think it should be possible to teach your cats too (do you share their pictures anywhere publicly?). Rusty is lucky to have an owner like you who thinks about his needs. I taught my cat tricks as well, and it’s funny to see the look on people’s faces who have never seen it before. Always good to read a Rusty post, Undina. He’s a star! Thank you, Richard. It’s a pleasure to have you as a reader.